Once again, I’m working on some projects that I can’t reveal yet…. however, it’s probably alright to give you a sneak peek, right? I’ve had glitter vinyl sitting in my stash for quite some time (I have a strong desire to make cool purses with this fabric), but still haven’t taken the plunge. 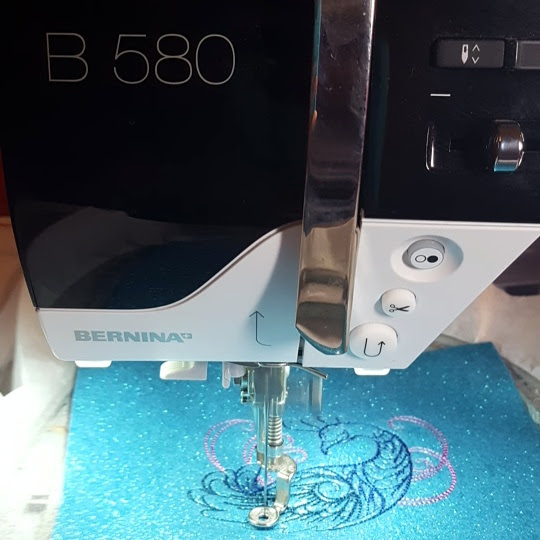 Last week, I decided that I needed to stop eyeing the vinyl and just work with it….. so I started by embroidering it. I attempted to do some research on how to stitch it up, but really didn’t find much so I went with a heavy weight cutaway stabilizer, a new needle, a lightly stitched design, and the ‘hoopless method’ – basically treating it like a (real) leather. The results? Awesome! I honestly think this is the way the way to go if you decide to work with glitter vinyl. Definitely use a lightly stitched design because I can see anything too heavy will eventually rip up the material (even the design that I used has a lot of running stitches that continually stitched over and over may be a bit much in some areas). Now that I’ve tackled this, I definitely will try it again…. I have 3 more colors in my stash to play with! This entry was posted in Uncategorized on June 19, 2017 by stacy.